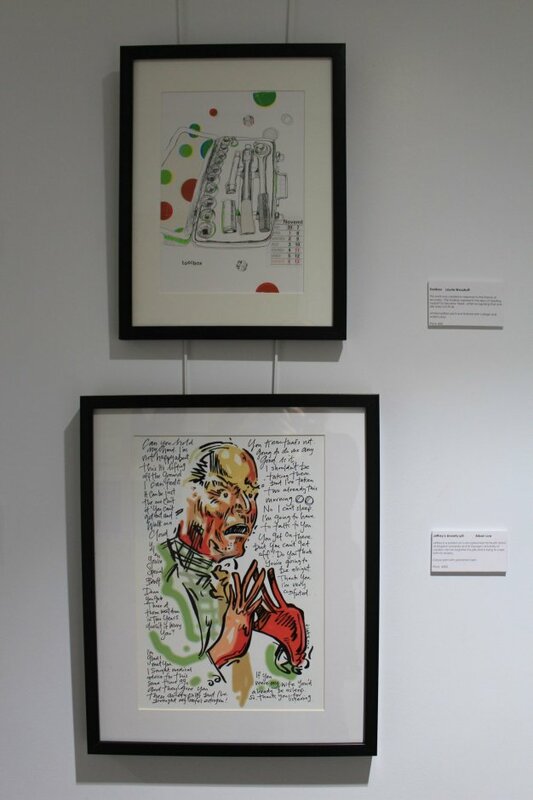 The Art Jazzed Up exhibition was a huge success with 80 artists exhibiting 250 artwork on the walls of the Shaw Gallery, Croydon. It was a mammoth task of organisation so thank you to Alan Carlyon Smith and his team at Trinity School for doing the hang. 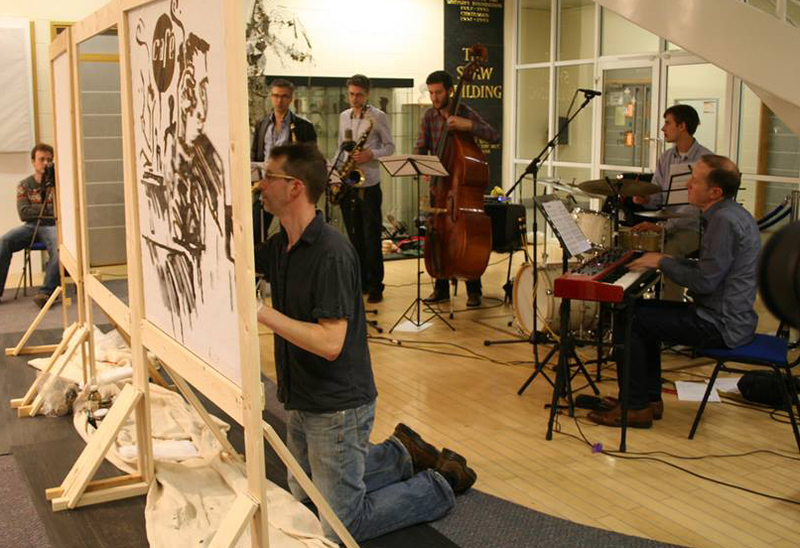 The part I was most nervous about was the performance, where I drew on 7 large paper canvases while the band of Mike DiRubbo, Duncan Eagles, Max Luthert, Dave Storey and Bill Mudge played on. I’m currently exhibiting and helping organise the Cardboard City exhibition along London’s Southbank. Every day from the 1st-24th December we’ll be opening the doors on an artists work. We’ve all responded to Stuart Simler call to arms and the theme Social Advent. Its all on the collectconnect website. Link Here. I’m working on several album covers at the moment. The hot one is Max Luthert’s debut which is the early stages. Catalan pianist Jaume Gispert’s is pretty much in the bag, its my first vinyl and I really appreciate the extra canvas to work on. 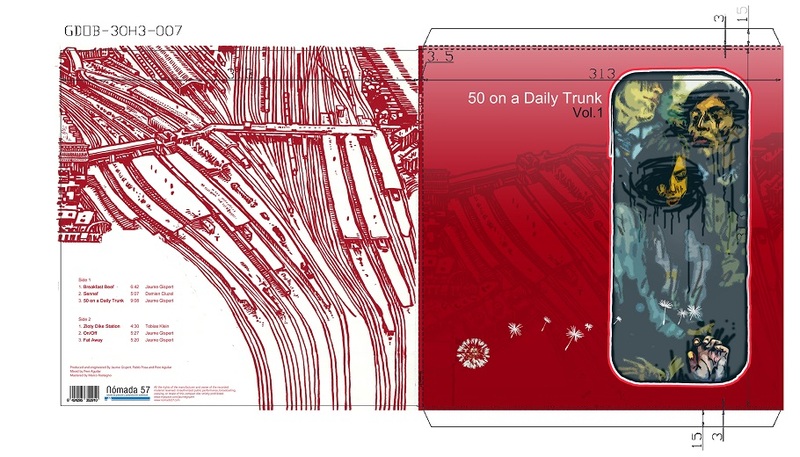 The group are called 50 On A Daily Trunk. Also Samuel Eagles artwork is finished too already for release in 2014. I also completed Lesley Christiane and Kelvin Christiane’s albums in November. I’m meeting the Wimbledon Poetry Circle this month and hopefully we will putting on an exhibition of Art and Poetry in March 2014 at the Village Hall Trust Gallery (Wimbledon). We’ve also been given one of the prestigious curatorial slots at next year’s Fringe Arts Bath festival. I believe we’ll be resurrecting the Fab Fridge street art exhibition. More info as soon as I know.